Focus on Free Motion Quilting Link-Up! I can't believe it's already the end of January! I hope you've enjoyed my Focus on Free Motion Quilting posts, and that you've taken some time to practice your free motion quilting this month. I worked some more on my Mermaid Swoon pillow block, and got the quilting finished. I decided to quilt the rest of the main (outer) part of the block with the curved outline stitching I started with, and then I did some more detailed stitching in the center square. You can click on the photo above to see it on flickr if you want a closer look. It's definitely not perfect, but I'm planning on practicing this type of quilting some more and I have faith that I'll improve over time :). This photo (above) shows the orange/turquoise plaid that I'm going to use for the back of the pillow. It's from Connecting Threads, and I think it's a pretty good match. I might use it for binding, too. Maybe on the bias? 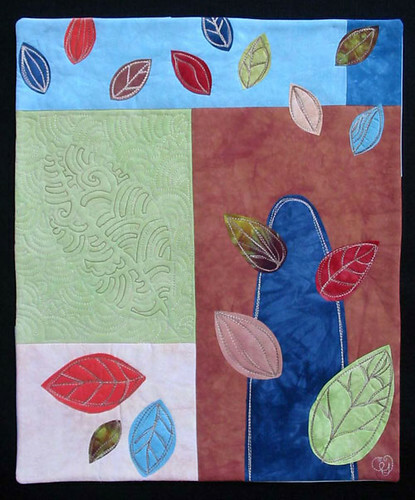 *Post a link to a blog post or flickr photo showing a free motion quilted project you finished this month. The project can be something that was started earlier than this month. *The link-up will be open until 10 p.m. (Pacific time) on February 1, and prizes will be drawn (and posted on my blog) with the help of the random number generator on February 2. One set of four cones of their Essential Pro polyester thread in Natural from Connecting Threads. 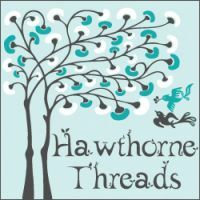 One Hawthorne Threads gift certificate for $50. And three Fat Quarter Shop gift certificates for $50. Thanks again to Connecting Threads, Hawthorne Threads, and Fat Quarter Shop for sponsoring Focus on Free Motion Quilting! Links to all of the blog posts in this series are located in the "Focus on Free Motion Quilting" tab below my blog header image. 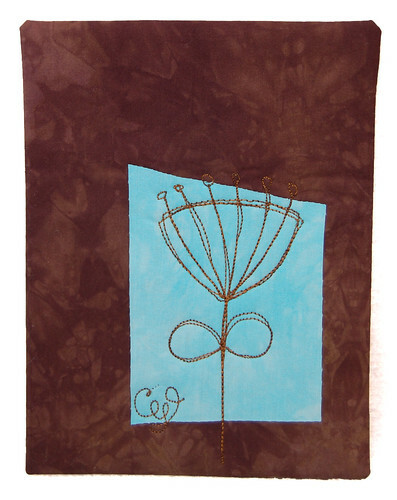 Today I'm excited to share a post from Candy Glendening of Candied Fabrics. Here she is! I'm using free motion quilting as a line to outline the tree and leaves, giving it a "sketchy" style that I admire in artists who combine water color and pen and ink - with a wash of color underneath a sketched shape. I really liked working in this style, but at this point, I couldn't bear to not use my "fancy" free motion work at all, I'd worked so hard to learn how to do it! My hope was that using it this way, as a smaller part of a larger whole, I could allow the free motion quilting pattern shine when I did use it. I looked for a way to emphasize this sketching even more. What is beautiful, worthy of contemplation, perfect and imperfect at the same time? Flowers! I started FMMS flowers and leaves a couple of years ago, and this is a subject that I have only scratched the surface of! Believe me when I say that I can NOT sketch with a pen/pencil AT ALL! When I want to sketch a new flower, I just take a quick look at the species I want to sketch (usually a Google image search), grab a scrap quilting sandwich and give it a whirl. Usually after one or two tries, I’ve got the shape I want to sketch worked out and I’m ready to go! There you have it - Free Motion Machine Sketching! I’ve been sketching flowers for a couple of years now, and I don’t see myself stopping any time soon! I hope this is provided you all a peek into yet another type of free motion quilting. Vicki, this is a genius idea, and all your “Focus on Free Motion” posts are going to be great references for lots of quilters for a long time to come! Thanks again, Candy! 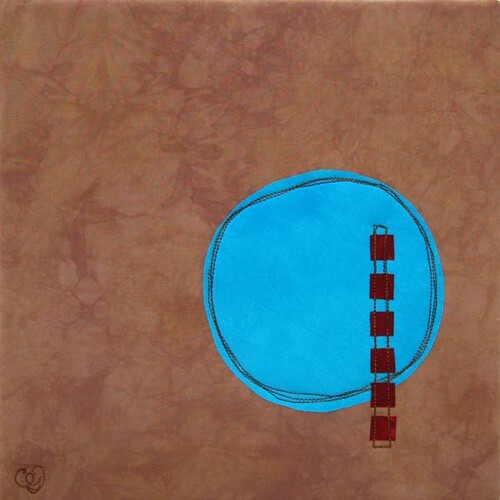 Your free motion sketching is such a unique and beautiful approach to textile art and quilting; I'm so glad you shared this with us! I might need to make my own botanical sketch quilt one of these days (some of you might not know that I was a botany major and studied the ecology of a rare plant in college.) Please visit Candy's website and her shop to find out more about the things she makes AND don't forget to check out her brand new fabric dyeing e-course! I hope you are almost ready to share your finished free-motion quilted projects on January 31, which is next Tuesday. 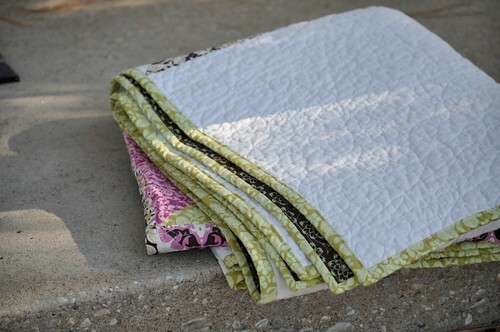 You'll need to link to a finished, free motion quilted project that was completed this month. Prizes will be drawn randomly later next week. Thanks to the sponsors who are providing our prizes! 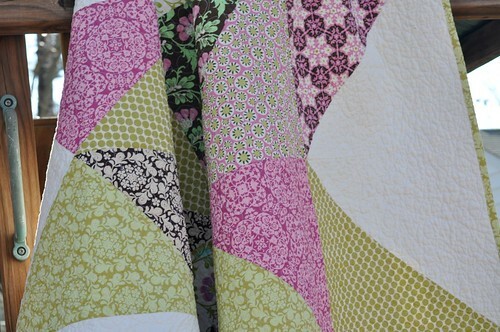 So, I've been thinking about making a Swoon quilt. I want my quilt to be smaller than the 80" square quilt you'd get if you followed the official pattern, so I did some drawing and figuring and tried out an 18" version of the block (the one in the pattern is 24"). It turned out ok; there were some cutting/calculation errors but got it figured out. I don't super-love the color combination--adding a colored binding around the edge might help with that, I think. I'm going to make this one into a pillow, after I quilt it some more. I've been feeling a little crummy and all I've done so far on quilting this is the curvy outline stitching, just on the white sections. I'm not very good at it, yet, but it's something I want to practice. 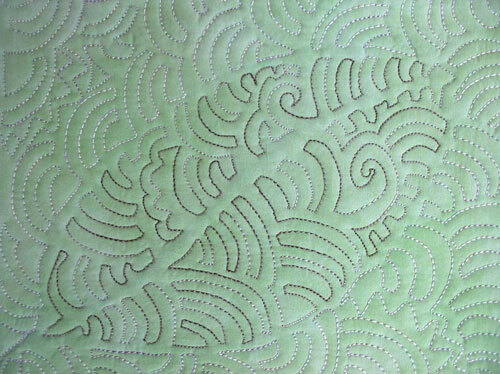 This is one of the techniques discussed in Diane Gaudynski's Guide to Machine Quilting. 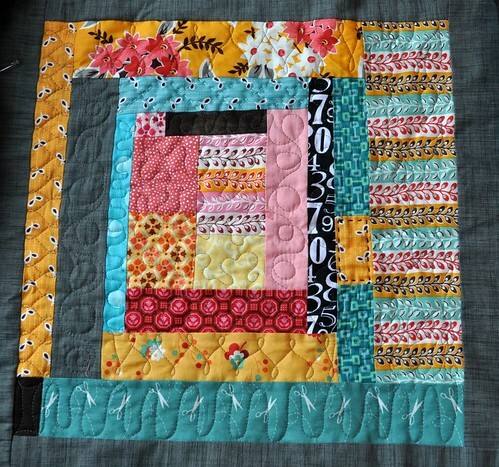 I'm not sure how I will quilt the colored segments of this block--do you have any suggestions? Have you ever done that? I've done it before. Oh well. I'm just going to cut the excess backing fabric away from the stitching and pull out the threads of the fabric piece that's caught in the quilting. 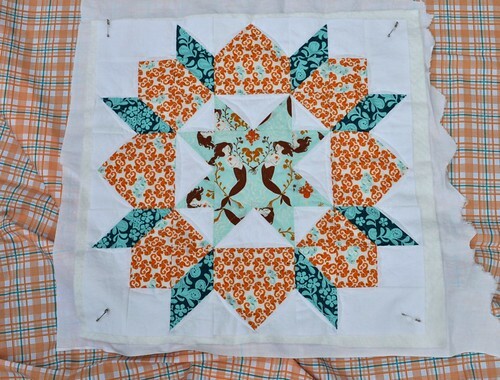 Are you almost ready for our end-of-the-month roundup of free motion quilted projects? (And the prize drawing?) What have you been working on? So I finished this little table runner up, almost exactly 1 year after I started it. Not bad, huh? I did a spiral of echo quilting inside each heart, and finished it off with machine-stitched binding. 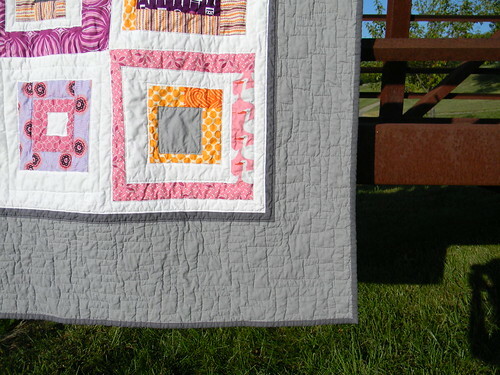 The straight lines in the echo quilting are not easy to do with the free motion foot! I'm still waiting for supplies to finish some of my current in-process bigger things, but I got another small project started that I'll share tomorrow. We had a crazy week last week, with school cancelled every day and the power out most of the day on Thursday. We were pretty lucky to have our power outage only last 12 hours; some people in the Seattle area are still without power after the snow-and-then-ice storms we had last week. I'm looking forward to getting back into a good routine and checking some things off my to-do list this week! Hope you are happy and warm! What are you working on this week? Hi! I’m Alex from teaginny designs. I know Vicki from our time together at the KCMQG, before she moved westward. I’ve been free motion quilting for about two years now, and Vicki was one of the people who really encouraged me to keep at it. I’ve got a lot of improving still to do, but as Vicki said, you really do get a little better with each quilt. 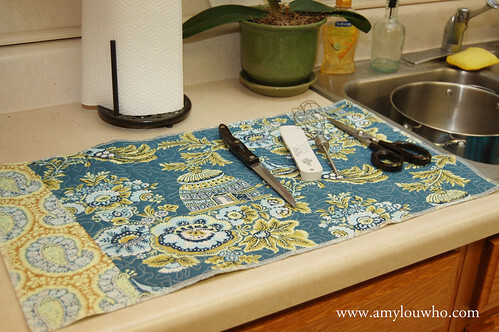 Besides lots of practice, there a few of tools and tips that have made FM quilting easier for me. Jaime, a seamstress and Bernina guru, hooked me up with an extension table for my sewing machine. Having a large surface that is level with your sewing foot is so helpful. 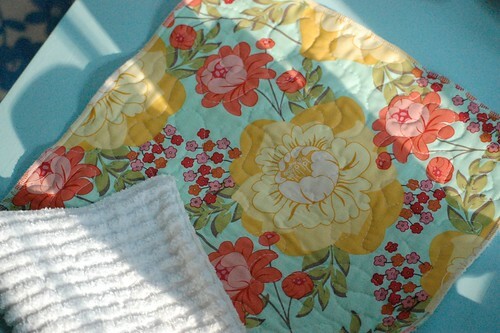 The quilt can move around smoothly, which makes the whole process a lot less frustrating! The other tip Jaime passed along to me is grabaroos quilting gloves. I’ve tried several different kinds, but these are the only ones that have worked for me. They are thin, so you can still feel the quilt in your hands. And only the finger tips are grabby, so you don’t get hung up while you’re moving the quilt around. 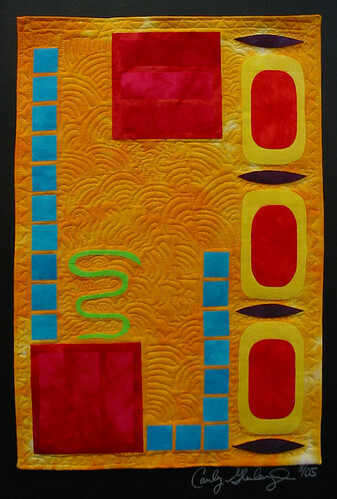 One final tip that helped me enormously was the concept of quilting your design in columns. I find it much easier to accomplish an overall FM design if I know where I’m going, and there’s no quilting yourself into a tight spot and getting stuck. 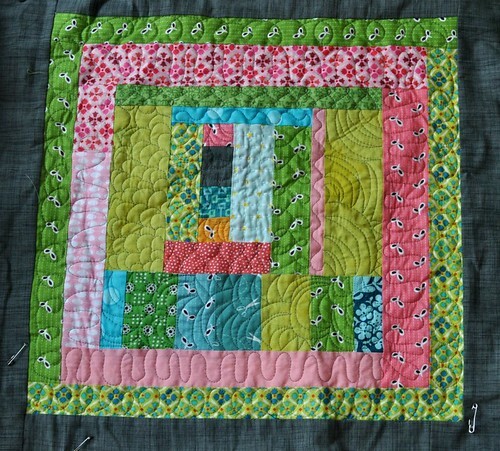 I actually enjoy FM quilting now, and I especially like taking my inspiration for FM designs from the piecing. It is a way to add another design element to the quilt. Thanks for hosting me, Vicki! It's Vicki now; thanks so much, Alex! 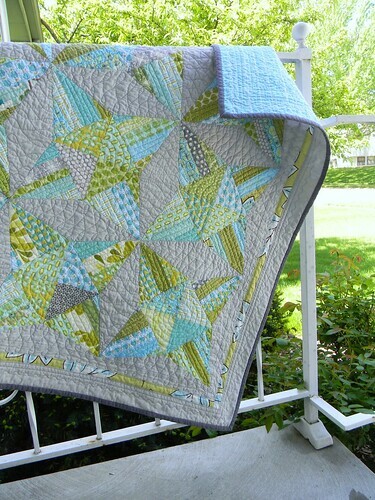 The quilting in your deep blue sea quilt (seen above and at that there link) is gorgeous! 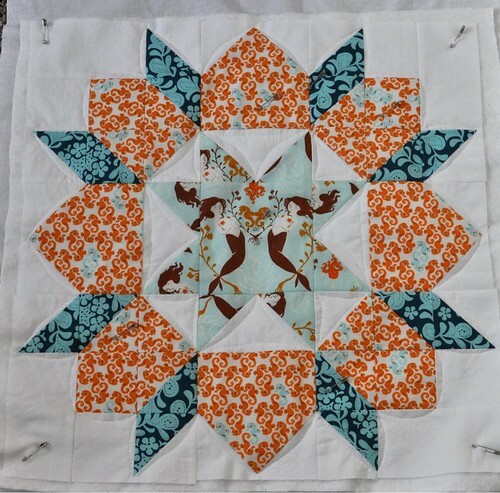 Please stop by Alex's blog and shop to see more of her gorgeous projects. We're getting closer to the end of the month, I hope you're working on your free motion quilted project for our link up and prize drawing on January 31! As always, thanks to the FFMQ sponsors! *Be thinking about what you want to do for your free motion quilted project for the prize drawing at the end of the month. It needs to be finished this month but can already be started if needed. The project could be a small mini-quilt or a large quilt, or something in between, it’s up to you. 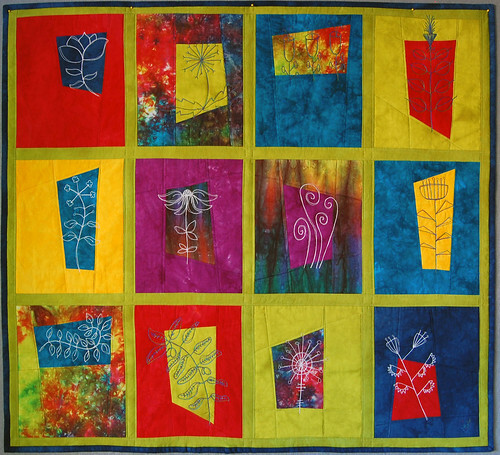 *About the prizes--there will be a link-up at the end of the month where participants can link to a blog post or flickr photo sharing their completed free motion quilted project. The link-up will be open for 24 hours and then winners will be chosen randomly from those who enter. I finished quilting 8 of the big blocks on my king size quilt and decided to take a little break from it. My quilting gloves are over 11 years old; they have plastic dots on the palms and fingers for gripping the quilt, but the dots (especially the ones on the fingertips) are losing their grip/slight tackiness and that makes it difficult to move that big quilt while I'm quilting it. So I ordered new quilting gloves and am also continuing to practice drawing my feathers. I have been reading up on how Victoria quilted her king size Christmas Crosses quilt in 2010 (she also used a home table-top machine) and I also put Diane Gaudynski's book, Guide to Machine Quilting on hold at the library. I'm pretty sure I will quilt long feathers in the sashing spaces and then do echo stitching around them to fill up the rest of the space. As far as the wide borders go, I'm stil not sure how I will quilt them. I think it's worth taking it slow so I can figure out what I really want to do on this quilt. I am going to finish up the quilting in the hearts but there is only so much light on a January day here so I wanted to get a photo before it's too dark. I will use red and hot pink thread in the hearts, maybe echo quilting in spirals into the centers of the hearts. 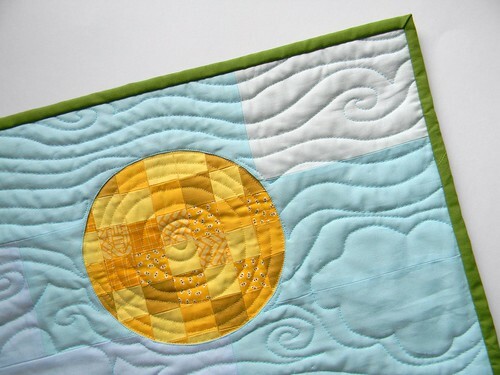 Have you been practicing your free motion quilting? What are you working on? Let me know in the comments! Thanks to the FFMQ sponsors! I really like that egg fabric in the border. And the colorful chickens. Karen says "the green one is molting." Too funny! I love the stitched legs and beady eyes, too. 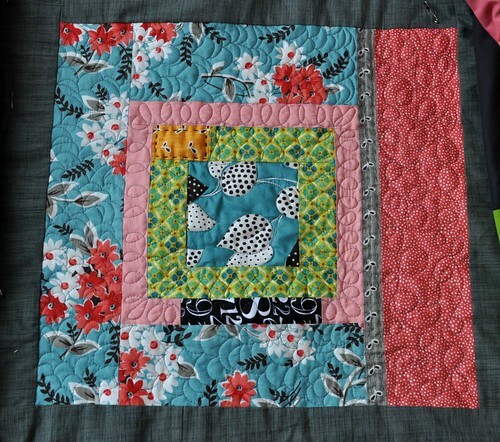 If you want to make a project with this quilt block you can find the tutorial here. 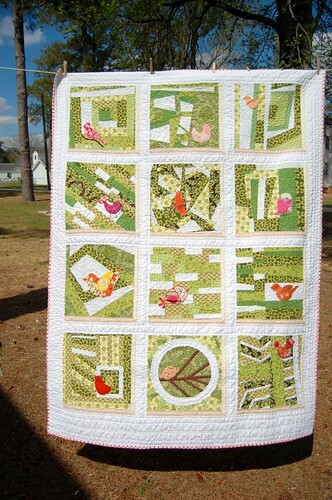 The chicks that I made for this quilt are made from a pattern in the book "A Quilter's Ark." Do you have chickens? How do you like them? Maybe one day (when we get into our own house again) we will try having chickens. 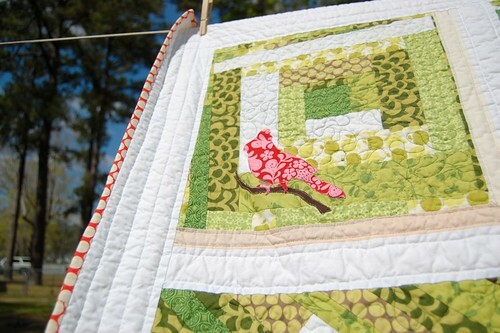 Or maybe I'll just make my own chicken quilt. Hi Sew Inspired readers! I'm amylouwho and blog over at www.amylouwhosews.com. 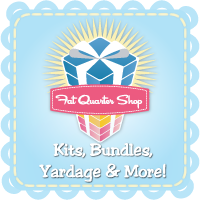 I was flattered that Vicki asked me to share my experience with free motion quilting! I am no expert, still a beginner, but have learned a few things along the way that I'm happy to share with you! I was spoiled from the get-go with free motion quilting, because my mom and her sisters have a long-arm quilting machine and that was the first way I ever did any free motion quilting. It was AMAZING!! That was over 10 years ago before I was really sewing again and I can't remember if I ever did more than one little baby quilt. Which I don't have a picture of. Sad, I know. My first project that I actually free motion quilted, by myself, on my little machine was my bird quilt from my very first online quilting bee, just a little over a year ago. It was a daunting task, because I loved the quilt but didn't want to ruin it. I decided to quilt each block individually as I did some straight line quilting in the sashing. 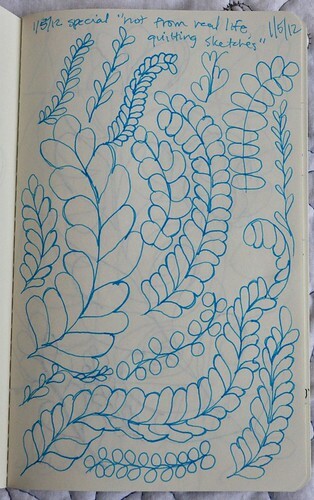 I practiced loop-de-loops, stippling, and even came up with my own leaf design. Focusing on a 14" block was a lot better than trying to look at the huge quilt as a whole. I used a variegated green thread to quilt with which was great on all of the greens, but the darkest part of the thread really shows my imperfections on the white. I would probably use white thread if I were to do it again. Something I started making to practice my free motion skills were quilted dishmats. Basically, a piece of cotton, cotton batting, and chenille. Spray basted together, quilted, and serged off on the edges. They are super easy to maneuver in your machine for practice, make great gifts, a quick finish and a nice way to add some color to your kitchen. 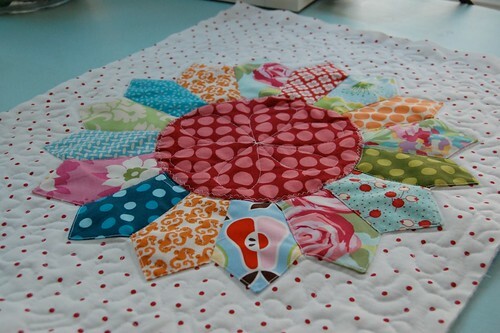 Another great way to practice free motion quilting, and quilting in general is by making mini quilts! I made my first mini-quilt for the Spicing up the Kitchen Swap on Flickr last year. and another after I attended the Sewing Summit last fall. I took Allison's (of Cluck, Cluck, Sew) free motion quilting class and learned a few new tricks and basically gained confidence that I might actually know what I was doing. I liked how she talked about doing your quilting in rows up and down your quilt. I always tended to go wherever and sometimes you quilt yourself into a corner, literally! The mini quilts are so satisfying and quick. And yes, it IS STILL QUILTING!! yeah! I have a serious problem finishing things in a timely manner! So something small and quickly finished feels great! I just finished a quilt a few weeks ago for a Christmas gift. Start to finish 3 weeks! It was a Christmas miracle! It is 72x72 finished, so it was pretty large in my little machine, and I had anxiety half-way through the quilting that I wasn't going to like it. And then I washed it and dried and it. And it was great! Not perfect, but that's okay! The hardest part of any new thing for me is the starting. Once I start quilting, I have to keep going. And once I'd free motioned a whole quilt, other projects seemed less scary. The thing that surprises me the most about quilting is that halfway through every large project I've done, I hate whatever it is I'm doing, and wished I had a long-arm. I'm so busy focusing on each tiny stitch and all of the imperfections that I see that I lose sight of what the whole quilt will look like quilted, washed and dried. 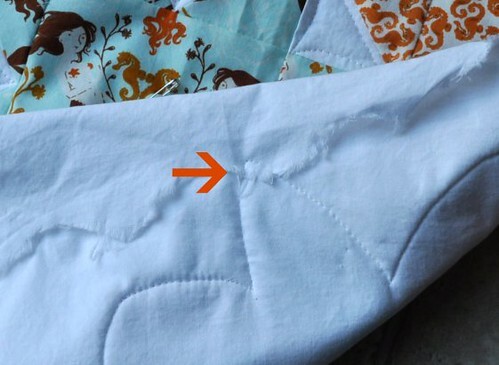 The stitches disappear, the quilt becomes crinkly and soft, and the overall look is one of pretty coziness. I need to remind myself of that while I'm in the midst of the quilting!! 1. Don't kill yourself over perfection. 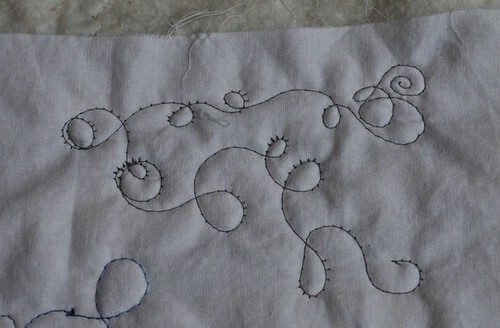 Very few people, if any, will analyze each stitch the way you will while quilting. 2. 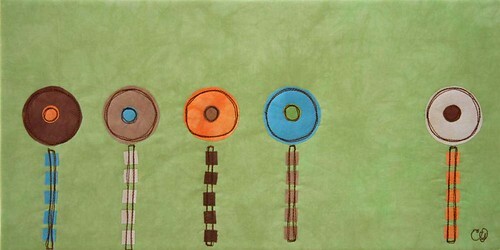 Use thread that matches the lightest fabric in your quilt. 3. I love my quilting gloves - they help keep my grip on the quilt. 4. Put the foot pedal all the way down. Going faster actually helps keep your stitches more even. This comes with practice, but I find my quilting always looks better when I'm moving my quilt slowly and the needle is moving quickly. 5. If your machine doesn't sit flush with your table, sit in a taller chair, or an a booster (I put my kid's booster upside down) to keep from hunching your shoulders up to your machine while you sew. I find this helps any time I'm spending a lot of time at my machine. 6. Practice, practice, practice! The more you do it, the better you get, and the more confident you will be! 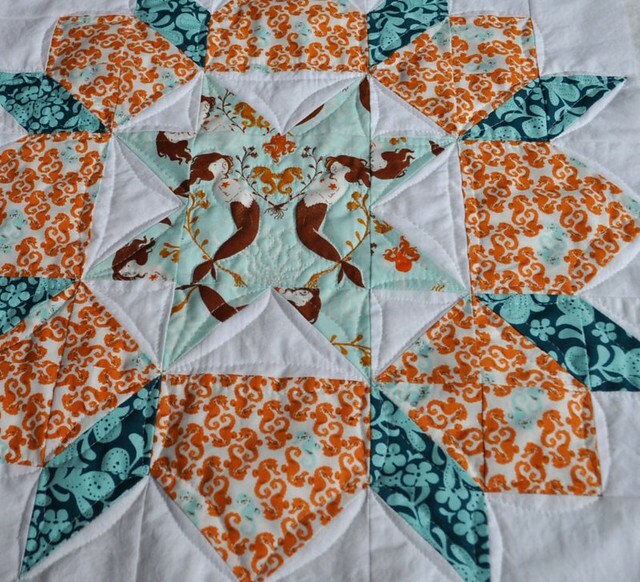 I would encourage any of you who are intimidated by free motion quilting to just start. Find some scraps and batting and just play! Have fun with it! After all for a lot of us this is a hobby that should be fun, not stressful! No get going and make something pretty and have fun while you are doing it! It's Vicki now, thanks so much to Amy for this post. I love your Christmas quilt and am very impressed with the quick turnaround. I can't wait to see what you make next! Please stop by Amy's blog and check it out; she's the host of Sew & Tell Friday which is a fun link up party occurring on many Fridays and encouraging us to finish up and show off our projects! 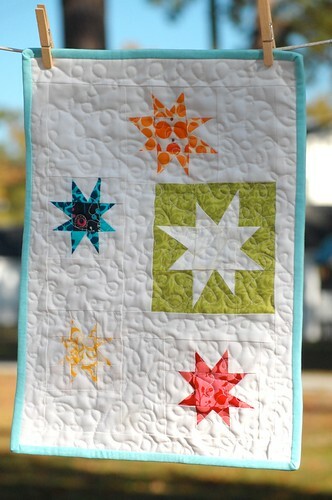 Also, I want to encourage you to post your free motion quilting practice or projects on the link-up from Tuesday's post. I'd love to hear about what you're working on! And finally thanks again to the Focus on Free Motion Sponsors! *Be thinking about what you want to do for your free motion quilted project for the prize drawing at the end of the month. It needs to be finished this month but can already be started if needed. The project could be a small mini-quilt, a large quilt, or something in between, it’s up to you. *About the prizes--there will be a link-up at the end of the month where you can link to a blog post or flickr photo sharing a completed free motion quilted project from this month. The link-up will be open for 24 hours and then winners will be chosen randomly from those who enter. 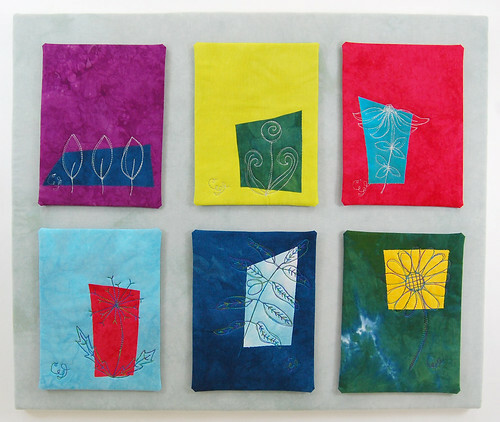 Hi everyone, welcome to week 2 of Focus on Free Motion Quilting! I spent some time in the last few days working on basting and quilting my king size quilt. It is challenging but I'm breaking it up into chunks to make it more doable. More on that in a bit. This is the bottom of my quilt sandwich, that's where top thread tension issues show up in my experience. I started on the bottom right with my tension at its normal setting. See all the places where the top thread was pulled down to the bottom? (April calls them eyelashes, they kind of look like it.) In the top right area of this photo, you can see where I adjusted the tension dial up to 7 and the top thread was no longer being pulled down. April also blogged about her tension issues, and also discussed the success she's had with quilting with her feed dogs up. Her practice free motion quilted leaves look great! Now about my project: I am quilting a king size quilt in a regular size domestic machine. In order to make this a little easier, I decided to only layer and baste batting into the middle approx. 1/3 of the quilt. After I get that part of the quilt all quilted, I'll hand baste the remaining batting on one side at a time, and baste and quilt those outer sides. I'm quilting the big blocks first and then I'll do the sashing. I took Elizabeth's advice and sketched out my blocks and how I would quilt each part of them. I have also been practicing drawing my feathers and other quilting designs. I'm going to keep practicing. What have you been working on? Do you have any questions or tips to share? Thanks again to the Focus on Free Motion sponsors! *Be thinking about what you want to do for your free motion quilted project for the prize drawing at the end of the month. It needs to be finished this month but can already be started if needed. The project could be a small mini-quilt or a large quilt, or something in between, it’s up to you. Over the next few weeks, I will share some projects that I think would be good for beginning or improving free motion quilting skills. 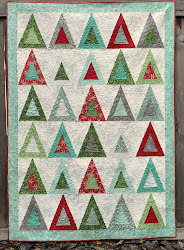 Focus on Free Motion Quilting!